Developed by Omega Force. Published by Tecmo Koei. Released March 25, 2014. Available on PS3, PS4 (reviewed), PS Vita (reviewed). People who say Dynasty Warriors games are all exactly the same don't know what the hell they're talking about. Of course, they also claim it's about mashing a single button, further damning themselves as jesters who should be ousted from civilized society, shunned and cursed for the fools they are. I like Dynasty Warriors, and while it's becoming increasingly "okay" to admit that, the stigma remains. Koei's latest efforts with the series haven't helped perceptions. Its expansions have been a little lazy in recent years, half-localized and lacking in fresh content that they are. Dynasty Warriors 8 went some way towards making amends, however, providing a deeper combat and weapon system, a ton of extra content, and some great new characters. It was, quite frankly, the best Warriors game I've played since the classic Dynasty Warriors 3 on the PlayStation 2. Xtreme Legends continues the traditional DW release cycle, adding characters and content to Dynasty Warriors 8. With the jump to a new generation, the series also makes its PlayStation 4 debut with a Complete Edition, combining the base game with all the Xtreme Legends material and offering some graphical upgrades. The most significant addition in Xtreme Legends is a full story mode for the series' most iconic character, Lu Bu. He Who Must Not Be Pursued gets a shorter story than the main kingdoms, though it can be split off into "historical" or "hypothetical" stages by performing certain tasks in-game. Each of the existing story modes are offered a bunch of extra chapters as well, and it'll certainly take a while to see all the extra campaign installments. As with every Xtreme Legends release, some new characters are on offer. The main three kingdoms get one fresh face each, with Wei receiving Yu Jin, Shu adding Fa Zheng, and Wu answering the long-awaited call for Zhu Ran. With Lu Bu getting his own story, it's only fitting his army gets a few new playable characters as well, with the strategist Chen Gong and his daughter Lu Lingqi joining the fracas. The new characters are certainly some of the more interesting in recent memory. Yu Jin fights with a trident that can be charged with various elemental powers, Fa Zheng wields a length of magic cloth that allows him to blink around the combat area, while Zhu Ran's fire arrows are tricky to use, yet entertaining in battle. Lu Lingqi brings back Lu Bu's old cross pike from DW6, and is fairly decent, but Chen Gong absolutely steals the show. Not only is he an amusing character, his weapon - a command scroll - summons soldiers to perform his attacks for him, bringing archers, guardsmen, and even charging cavalry into the fight while he gives the orders. He's a ton of fun to use. Ambition Mode - a non-story city building game introduced in DW8 - has been bolstered with a whole new post-game mode, though it requires you having gone through the grind of completing the original mode first. 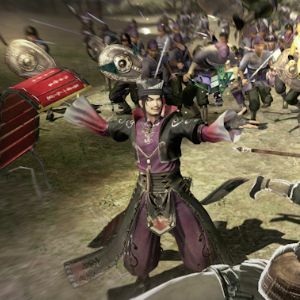 Essentially a stripped-down game of Dynasty Warriors: Empires, Ambition's Conquest mode is all about securing territory, providing some enjoyable fast based battles revolving around capturing enemy bases and holding them, while giving commands to the soldiers in your unit. While not as in-depth as Empires, I'm finding myself thoroughly entertained by it.